When you first open Photos, it scans your library to identify people in your photos. 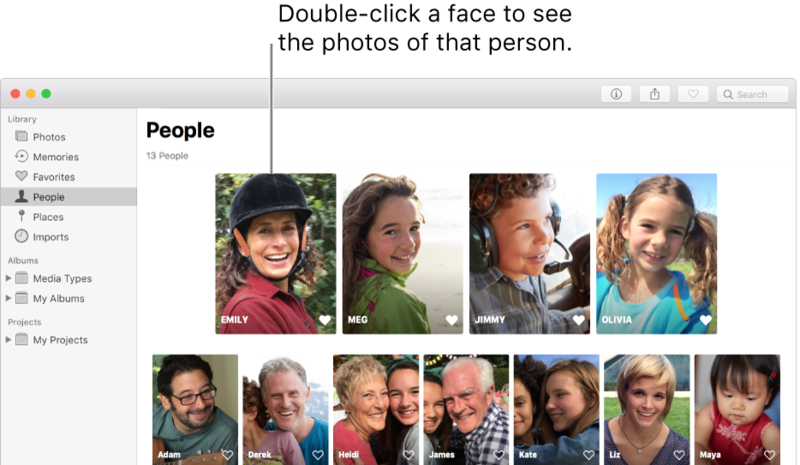 After the scan is done, you can open the People album, view collections of photos organized by the faces in them, and assign names to the people Photos found. As you import new photos into your library, Photos scans them and matches any people in them to the people you’ve identified. You can also identify the people in your photos manually. Note: If you use iCloud Photos, the people identified in your photos are synced across your devices. In the Photos app on your Mac, click People in the sidebar. People that you mark as favorites appear in large squares at the top of the window. To make a person a favorite, click the Favorites button on the photo. You can also drag someone into or out of the favorites area at the top. Double-click a face to see the photos of that person. To see entire photos or only faces, click the Photos or Faces button in the toolbar. To see all of a person’s photos or just a selection, click Show More or Show All at the top of the Photos area. Review and confirm other photos that contain this person: If Photos has identified additional photos of a person for review, a message appears in the toolbar. Click the Review button to review and confirm photos of the person, then click Done. If no message appears, scroll to the bottom and click Confirm Additional Photos. When Photos presents a matching face, click Yes to confirm the person’s identity. Click Done to stop reviewing matching faces. Select a photo as the “key photo” to represent all photos of a person: Control-click a photo, then choose Make Key Photo. View photos on a map: Scroll down to the Places, then double-click a photo thumbnail to see the location where the photo was taken. Make a person a favorite: Scroll to the bottom and click Favorite This Person. Click Unfavorite This Person to remove them as a favorite. Create a memory from photos of a person: Scroll to the bottom and click Add to Memories. Click the Name button on the photo of the person you want to name, type a name, then press Return (or choose a name that appears as you type). All the photos in the group are assigned the name. To rename a person’s photos, click the name and type a new name. If you find more than one group of photos that identify the same person, you can combine the groups. Select the groups of photos that you want to combine. Control-click one group, then choose Merge [number] People. Some photos may contain people who are not automatically named. You can name them manually. In the Photos app on your Mac, double-click a photo to open it. Choose View > Show Face Names. Click the name (or click “unnamed”) under a face, type a name, then press Return (or choose a name that appears as you type). Click the Info button in the toolbar. Click the Add button , drag the circle to position it over the face if necessary, click the Name field, type a name, then press Return. You can click the Add button multiple times to identify multiple faces in a photo. To remove a name that you added to a face, click the Remove button on the person. To stop showing face names in photos, choose View > Hide Face Names. Control-click the person, then choose Remove This Person. Click Remove from People Album. Double-click the person, then scroll down and click Remove from People Album. To delete a photo from your library, see Delete photos or recover deleted ones in Photos on Mac.